Dubbed "CleanKey," the keyboard is waterproof and fully submersible, even when it's still plugged in. You can also quickly wipe the surface, which is sealed and has no crevices for dust (and bacteria) to hide, as traditional keyboards do. Devlin Electronics designed the keyboard mostly for health care institutions and schools, where illness can spread through shared computer equipment, such as keyboards and mice. 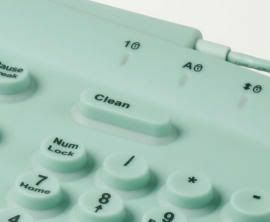 The CleanKey was inspired by numerous studies highlighting the potential health risks of computer keyboards, which are said to be frequently dirtier than the average toilet seat. That's how Crave describes it and I think it's an interesting concept. Not only is it safe to wash/submerge in water, it's less likely to get really dirty in the first place because there are no real crevices for stuff to fall into....or for bacteria to grow in. It looks kind weird and I bet it'd be even weirder to actually type on. I remember having a plastic cover on our keys in schools that were meant to be put on when the keys weren't being used to protect against dust. Well the teacher would sometimes makes us put those on the keys to keep us from seeing what the letters were and it made it sooo hard to type, lol. Not because we couldn't look, but because the keys felt really weird! I can only imagine how long it'd take to get used to these. Who knows how much they actually cost either, but maybe they'll catch on and the price will come down over the years like with so many other things. It's certainly something to keep an eye on.